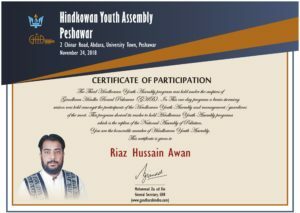 Hindkowan Youth Assembly Program was successfully held in Peshawar on November 24, 2018. The programme was organised at the Sain Ahmad Ali Auditorium of the Gandhara Hindko Academy. The auditorium is named after a great Hindko mystic poet Sain Ahmad Ali. Joint Secretary of the board, Ahmad Nadeem Awan, conducted the proceedings. Present on the occasion were board Vice-chairman, Dr Salahuddin, General Secretary Muhammad Ziauddin, Iqbal Sikandar, Sikandar Hayat Sikandar, Saeed Paras, Touqeer Ahmad, Saqaf Yasir and the youth assembly members. Noted Hindko writer, poet and research scholar, Muhammad Ziauddin, in his address said the youth assembly meeting was aimed at creating self-confidence among the youth and encourage them to display their talent. Ziauddin, who has to his credit several Hindko language books and publications, said youth were an asset and their role is a must for the promotion of any language and the associated culture. “You should come forward and work in unison to promote the Hindko language and culture,” he urged the youth assembly members, adding language was a source of identity and this source should be strengthened as the promotion of languages ultimately reinforces the national unity. 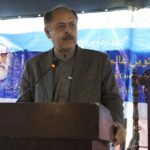 Dr Salahuddin said that Hindko is among the nine officially recognized languages of Pakistan and efforts should be made to preserve and promote it along with other languages and cultures. He exhorted the youth assembly members to come with innovative ideas to promote the Hindko language and culture and use this platform to convey their suggestions to the government quarters. The forum was open later. The youth assembly members expressed views and pledged to work for the promotion of the Hindko language and culture.